Padula & Partners is an international consulting firm specialized in Talent Management, contributing with a tailor-made and efficient support to clients in the management of the Talent entire life-cycle. 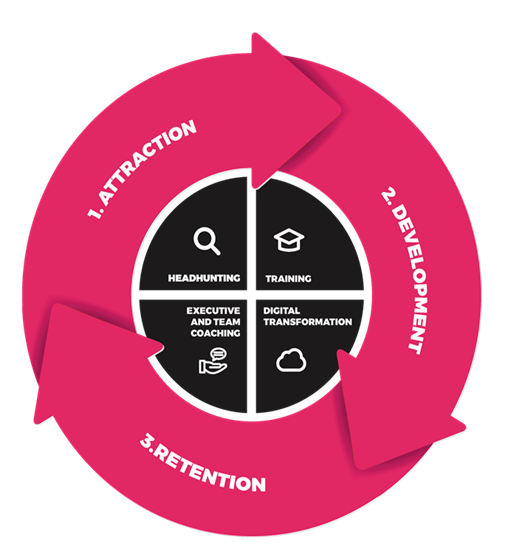 The Human Talent Management within the organizations has a life-cycle starting with the identification and Recruiting and leveraging through Training and Development, but completely useless if we fail at the retention phase. In all these phases our team has gathered a 25-year experience compiling knowledge and criterion.We have developed a large consulting services catalog comprehending Executive Search, Training, Coaching or Development of Leadership Skills, among others. We understand consulting as a handcrafted process, unique and unrepeatable. There are not two equal professionals or two organizations alike. Therefore, we cannot offer a service or a project identical to any other, not even similar. We are different because we choose to do a tailor-made work. We analyze your needs, your challenges and goals, your differential drivers…and we embrace them. Our commitment and our challenge are to facilitate change; our goal, to support clients in their way to market leadership. In your growth and change processes, contributing with human quality, experience and knowledge, always focused on your people. We think of emotions as authentic professional capacities generating added value and able to be quantified and qualified. This quality makes us different in terms of human beings, enriching and diversifying our individual contribution to organizations. We consider ourselves as craftsmen, being able to elaborate an original and unique work for each client, always ensuring completely customised solutions. Always present in our mind and in the design of specific and different tools, based on people’s creativity and emotions. We are aware of the privilege of experiencing the awesome challenge of Digital Transformation. We help our clients to transform this challenge into a competitive advantage.